Put new front brake pads on the XJ. No more squeeling for awhile. This came off an 94 model I believe. It fits snug on my 97, just had to massage the a-pillar mount a little. Now I will pull the fender off to cut the internal hole to the airbox. But first, I must either relocate the windshield washer bottle (kinda bulky) or pick up a somewhat smaller one from the JY to mount somewhere. Last edited by macsXJ; 06-04-2009 at 08:04 AM. i did a couple quick things today. i did the infamous airbox mod an cut a few extra holes in my airbox. i also got some mounts and mounted my maglite to the driver side pillar in my jeep. Mac, the snorkel looks Great, Bro!! I ordered extended front bump stops and I will be getting some square tubing to build rear extended bump stops. The fender trimming just isn't keeping the tires and sheet metal from meeting when flexed out. steering has jammed up a couple of times, too. I am systematically working out all of the bugs from installing the more flexable control arms. I will be doing some trimming on the rear wheel wells this weekend, too. Brian, where you building these at? I should be around sat afternoon if you need a welder and help, sunday taking the bike back to the trials. a day ago or so <-- sorry bout the late post. Finally went to The scrapyard and got me a new driver's side mirror. It was pretty much the only cassaulty of my jeeps flop onto it's side a couple weekends ago that couldn't be repaired. Glass was broke and the cables for the remote adjuster had been ripped out. One good as new complete driver's side mirror...Quadratec price $114.00 + shipping....I don't think so!! !......Christian's Auto Recyclers price $15.00 plus about 20 minutes of my precious time. I LOVE JUNKYARD SHOPPING!!!!!!!! I picked up a winch bumper off of a Dakota last weekend at the junkyard. 20 bucks and it is made out of 1/2" material. I gave my jeep a new home. Its retired from Carport, to its very own garage..
Sweet tampa, was it the pull-a-part off steele st? I got the front drive shaft and 4x4 linkage from the JY $50 total, installed and working great. Awesome JY find, Bobby. I finished up the rear fender trimming last night. Took off about 1.5 inches of steel all the way around with out moving the OEM fender flare mounts. I'm going to install the front extended bump stops tonight. They are daystar 1.75 inch extended bump stops. I should be all set for the Reiter Run this weekend. Yeah that is my favorite spot to go cause it is so close. They only had one XJ last time I went though. tyrhine, I have a good intake upgrade for you if you haven't done any yet. 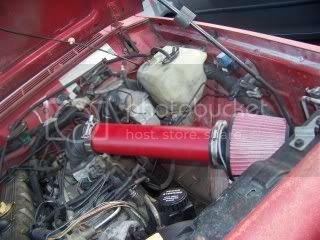 Pull the flex hose off of your air box where it goes out to the motor. look in the box where the short section of hard plastic hose is molded into the air box. You will notice there is a spool looking plastic thing inside there. What this is is something some genius engineer came up with to cut down on induction noise...what it also does is seriously cuts down the volume of intake you can get into your motor. It's kind of a Beee-otch to get out but, once you get it out, take your Jeep for a spin and put your foot into it a little. You will definitely feel a difference in the seat of your pants. Let me know how this works for you.